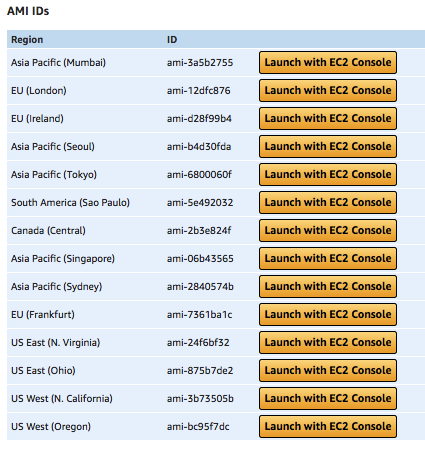 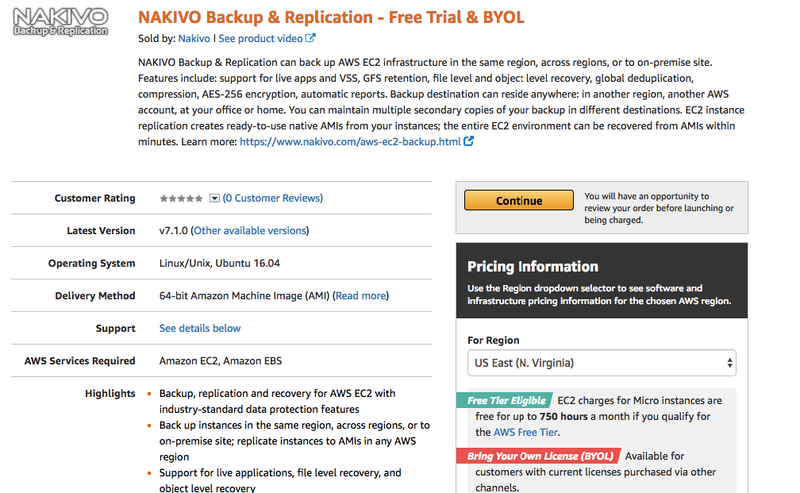 Before you click continue and proceed further with the configuration of your Nakivo Backup and Replication AWS EC2 Instance check the region and the pricing as the pricing can vary based on the region being selected. 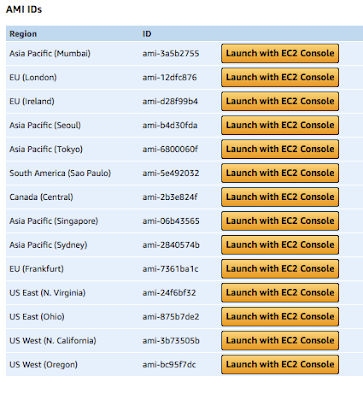 Once we click continue we can either proceed with 1-Click launch which will give us a quick overview to select Region, Choose the EC2 Instance Type, in this blog I will be proceeding further with t2.micro instance which is running with 1Gib Memory and 1 Virtual Core, we can also review VPC settings and security group wherein we can create a New VPC if there it's not already existing and create a subnet within VPC. 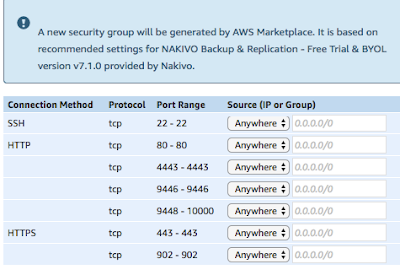 While specifying the Security Group we can create new based on seller settings or choose from the drop down menu and can make use of the existing ones. Which will give us few more options to chose the connection method wherein we can specify the Source IP (Anywhere, My IP, Custom IP). 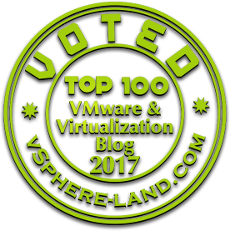 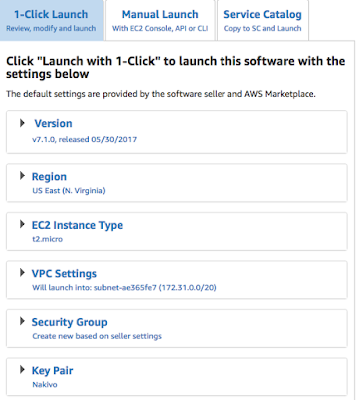 The Second option in the list is the Manual Launch option which provides us the version details and Amazon Machine Instance Id's which is required to launch an instance in cloud. 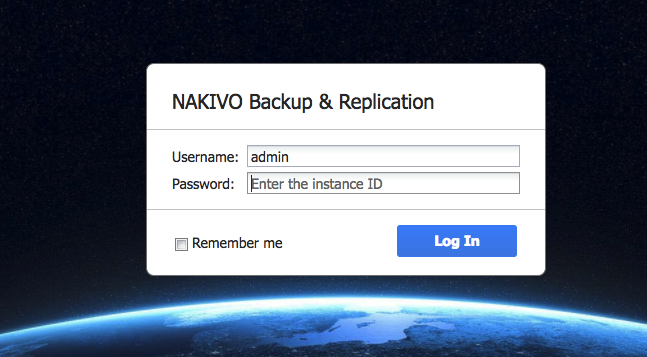 The last option is Service Catalog which allows us to copy the Nakivo Backup and Replication software to Service Catalog in a specific region where that service is supported and then we can further assign users and roles. In this Demo I selected 1-Click launch option to create my Nakivo Backup and Replication EC2 instance and created a new key pair. 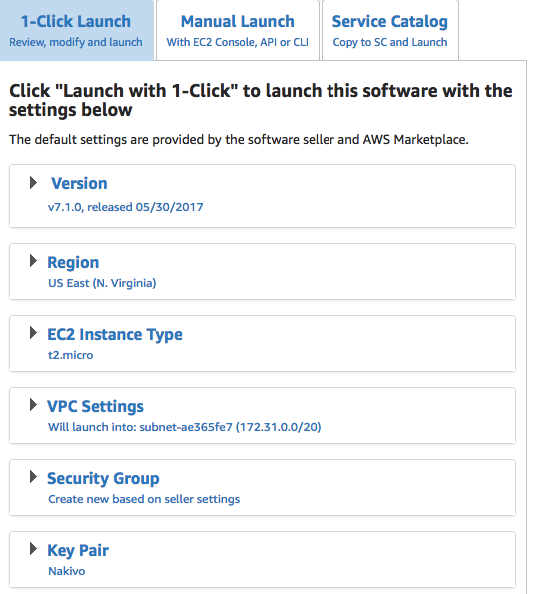 Once the instance is up and running we can login using the default username admin and the password would the AWS EC2 instance id.